Theorema Esprit d'Été is a popular perfume by Fendi for women and was released in 1999. The scent is oriental-sweet. The production was apparently discontinued. 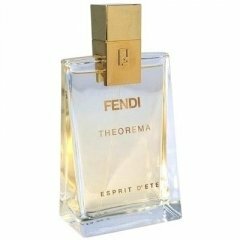 As someone who very much appreciates Fendi THEOREMA, I was delighted when awesomeness sent along an atomizer of THEOREMA ESPRIT D'ETE, which is an apt flanker to its namesake. This composition, too, opens with citrus, but has pared down the original note list and also combined them in different proportions. The rich, resinousness benzoin and amber so central to THEOREMA serve here more as complements, to embellish the blooming jasmine. Of course, the inevitable consequence of reducing the basenotes is lighter sillage and less longevity. But these features do make ESPRIT D'ETE wearable in hot weather, where THEOREMA arguably is not. I'd love to have a bottle of this for summertime and regret not having picked up the one I saw a while back at a discount emporium. Write the first Review for Theorema Esprit d'Été!